You can see a large number of advertisements for hair growth products being publicized all over the media because the hair loss issues are a serious concern for many. Some of us keep on searching for the best hair growth supplements or products…and keep changing one hair care product after another. But many of us do not give importance to the good foods that promote hair growth as much as the attention we pay to the hair care products. If you care for your hair dearly…then the first step is to identify the foods for hair growth and include them in your daily diets. I am sure that nobody likes to see their hairs falling off excessively or their scalp turning bald. It is the foods for healthy hair that will make the maximum impact on the permanency of your hair and its beauty. In this article, we are going to see the best foods for hair growth that contain the essential vitamins and nutrients required for the hair. What Matter For Healthy Hair Growth? At first, let us have a brief understanding of the hair growth mechanism in our body. The hair follicle can also shrink and lose its capacity to grow hair due to lack of protein and vitamin supply to them. As our body needs vitamins and nutrients for growth and development…for the hair growth also vitamins and nutrients are required. If you need to make your hair grow healthy, it is important to make sure that your body gets the essential hair growth vitamins and nutrients regularly. Of course, there are hair growth supplements that might help in supplying these required nutrients for the body….however, they have their merits and demerits on health. It is the food that we eat that will give our body the right type of nutrients required for hair growth and also for a healthy body. Let us have a look at each of the vitamins and nutrients required for the hair growth and the natural foods that can supply them to our body. In the absence of sebum, our skin and hair will be dry and unhealthy; the scalp also becomes thicker. It is only with the help of Vitamin A and E the sebaceous glands will be able to produce sebum lubricant. High vitamin A foods include sweet potatoes, carrots, dark leafy greens, winter squashes, lettuce, pumpkins, dried apricots, cantaloupe, bell peppers, fish, liver, tropical fruits and in all yellow colored vegetables; these are best foods for hair growth. Since Vitamin A is a water-soluble vitamin, it is best absorbed by the body when it is consumed along with fat. As it is also a water-soluble Vitamin, the body does not store it and usually flushes out the excess dose of daily consumption of all water-soluble vitamins. The body needs this vitamin regularly, and so the regular consumption foods with Vitamin C are necessary for good health. Vitamin C also needed for the better absorption of iron by the body. One of the main reasons for breakage and loss of hairs is the lack of Vitamin C in the body. Almost all sour fruits/citrus fruits like lemon, gooseberry, orange, etc. are healthy food for hair as they contain Vitamin C in rich quantity. This vitamin is also found in blackcurrants, blueberries, guava, kiwi fruits, strawberries, broccoli, papaya and sweet potatoes…these are good foods that promote hair growth. The diet that gives body Vitamin E is said to be good food for hair growth and healthy skin. Like Vitamin C, this one also helps in strengthening the capillaries to increase the blood flows into the hair follicles. This Vitamin protects the hair from sun damages and also adds shine and glossiness to the hair. Using shampoos and hair creams that contain Vitamin E is good for improving hair growth and stopping hair fall. Oils, seeds, and nuts are foods good for hair as they contain Vitamin E in good amount. This vitamin is also a co-factor nutrient of Vitamin A. Your list of best food for hair growth must compulsorily have Vitamin D rich foods such as fatty fish like tuna, mackerel, and salmon; all dairy products, orange juice, soy milk, cereals, beef liver, and egg yolks. However, people with a weak digestive system could experience biotin deficiency, and this can be mitigated by taking biotin-rich foods like egg yolks, liver, and yeast. Other best sources for B7 vitamin are peanuts, sweet potatoes, almonds, carrots, salmon, tomatoes, and walnuts. In extreme cases of biotin deficiency…a person may need to take a good quality biotin supplement. The deficiency of iron in the body causes a disease called anemia which usually results in hair loss besides other health complications. The body also requires the mineral iron for the smooth blood flow into every part of the body including the hair follicles. Anemic health condition reduces the supply hair growth nutrients to the hair follicles via blood and it eventually leads to stunted hair growth and increasing hair loss. Naturally, everyone needs to consume iron-rich foods for good hair growth. The best source of iron is the red meat…in fact, animal meat has the best quality iron that is easily absorbed by the body. All sorts of meats like beef, pork, mutton, poultry, and fish too have rich iron content. If you are a vegetarian, then you need to depend on vegetables like lentils, spinach, and all dark-green-leafy-vegetables (broccoli, kale, salad greens, etc.) for this essential mineral. It is also found in Seafood, beans, dry fruits, peas, and mushrooms. The vegetarians may require taking additional iron supplements to prevent the occurrence of anemia as iron from vegetables are not easily absorbed by the body. Here again, Vitamin C is important as it has the ability to boost iron absorption by the body. The hairs are made of protein….naturally, the best foods for hair growth have to be those containing a sufficient amount of good quality protein. Long and healthier hair development requires a protein-rich diet. If your hairs are brittle, weak and dry, probably it is a sign of protein deficiency in your body. Best sources of protein are meat, fish, and eggs. For those who are vegetarians need to consume a lot of legumes and nuts. Choose chicken, turkey, fish, dairy products and eggs as excellent sources of protein along with vegetarian sources such as nuts, sprouted beans, peas, lentils, lima beans, peas succotash, kale, broccoli, white mushrooms, and sweet corns. All legumes (beans) and dark-green leafy vegetables have a good amount of protein in them. 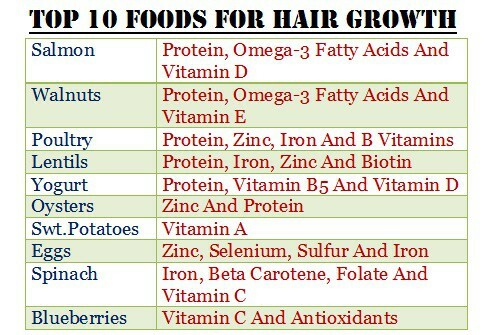 The list of healthy foods for hair growth must have at least 50 grams of protein intake per day by adults and teenagers. Omega-3 fatty acids nourish your hair follicles for stronger and shinier hair. It reduces the hair breakages and maintains the hair moisture. The best and quality sources of omega-3 fatty acids are seafood, especially the salmon, sardines, trout, mackerel, and herring. The plant foods that have a good bit of it are walnuts, pumpkin seed, avocado, flax seed oil, chia seeds and most of the other nuts and seeds. Naturally, the development of cells in the hair follicles and hair strands also require the help of zinc to happen so. Zinc-rich foods like oysters, beef, and eggs are good for hair growth. All meats and fish have a good amount of zinc mineral in them. Other good sources of zinc are nuts, whole grains, legumes, and yeast. Fruits and vegetables are not good sources of zinc because the zinc in plant proteins is not as available for use by the body. The zinc from animal protein works the best for the body. As we have already discussed the best vitamins minerals with their food sources…now it is easy to pick up the ten best foods that together contain every nutrients and vitamin required for healthy hair growth. I have arranged them in a chart as given below. yah..foods with hair growth vitamins make a lot of difference in hair growth.It is seen that the people who regularly eat fish have better hair growth and delayed graying. Foods are important. If you want to see the best results in stopping split ends and faster growth of longer hair, try to apply a mixture of organic castor, coconut and almond oils. Apply it on the scalp and, if possible, let be there overnight. All the very best.